It seems like during the week I was gone, the garden declined suddenly, maybe it really needs me to walk around daily and check in on how everything is going :-) In any case, although many plants are winding down, some are still in their full glory. Agastache 'Blue Fortune', with Rudbeckia triloba in background - I think these are pretty much reaching the end of their bloom...although they've performed admirably, and I really like them in combination with the Rudbeckia next to them and the Knautia in front. Persicaria 'Taurus' - This plant just keeps growing and flowering. Unlike many plants that look a little ratty at this time of year, these look fresh and vibrant. Eupatorium 'Chocolate' - I have to say, my main reason for growing this plant is its lovely, dark foliage, which is attractive throughout the entire growing season. The flowers, which I rarely even think about, are quite lovely at this time of year, however. 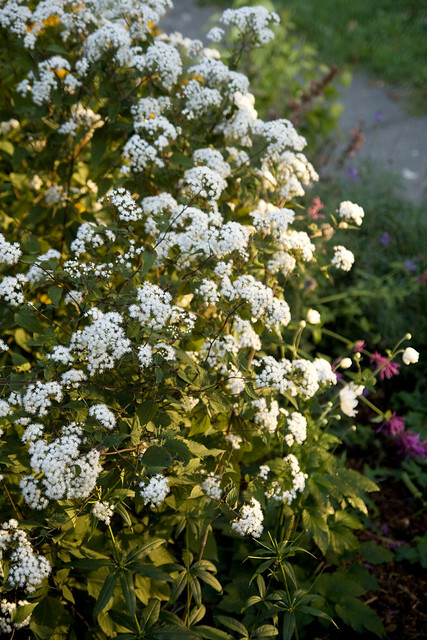 They are a wonderful, bright, pure white and look like a cloud floating near the back of the garden. Geranium 'Ann Folkard' - These took a little break during the heat of summer, but have re-grown their crowns and are blooming again. 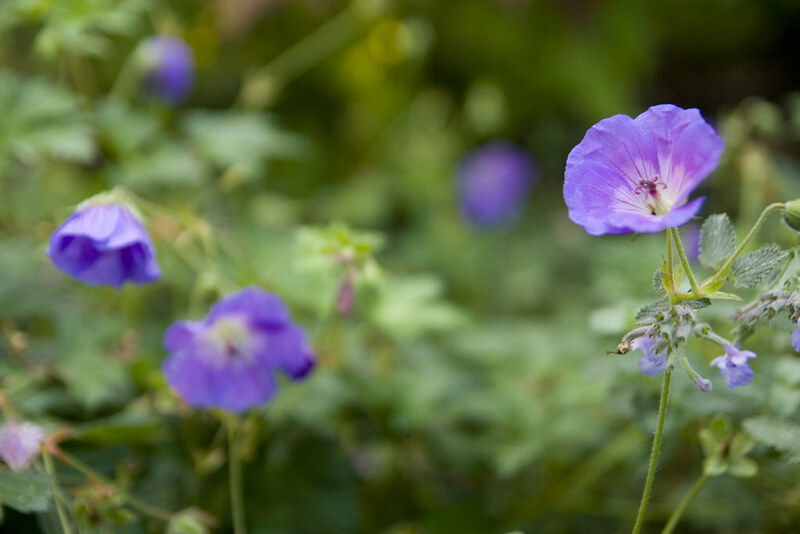 Geranium 'Rozanne' - What can I say about this plant that hasn't already been said. They are wonderful and have bloomed continuously since I planted them in June. They are truly one of my garden all-stars. 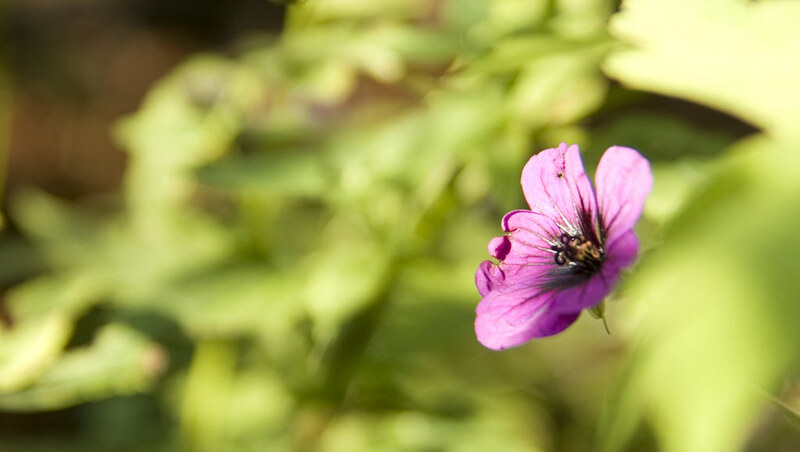 Another Geranium whose name escapes me and a native Malva...the Checker Mallow. Persicaria virginiana - Although I planted this for the foliage (having never seen them in flower), I have to say I kinda love these blooms. They are really weird looking and completely transform the plant! 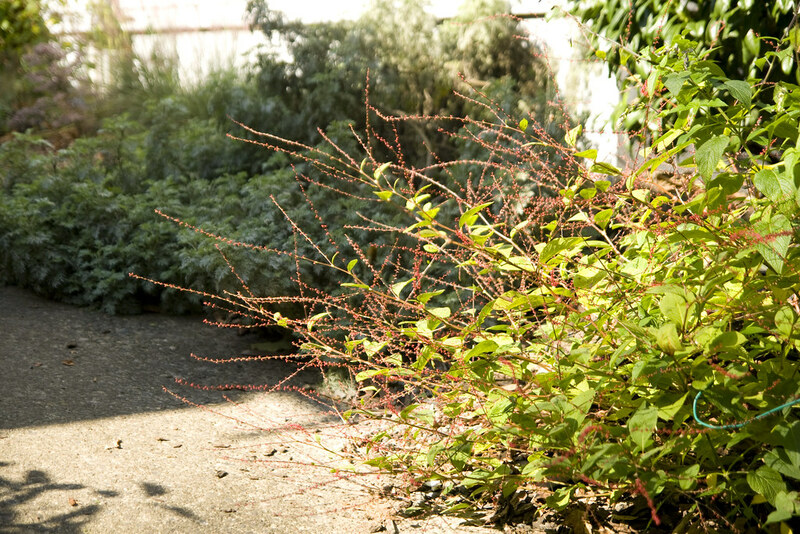 Persicaria 'Red Dragon' and Centranthus ruber - 'Red Dragon' continues to put forth its sprays of small, white flowers. They aren't particularly noticeable, but are charming, nonetheless. 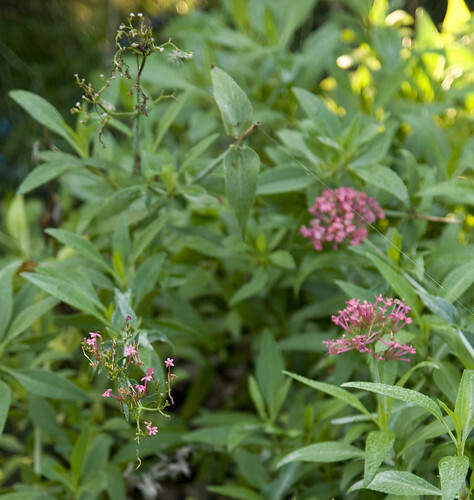 The Centranthus has bloomed constantly since this spring, but has decreased in flowering over the past month or so. The plants are starting to get bushier, however. Rudbeckia 'Goldsturm' - What a performer, these workhorses continue to flower, but the end is in sight, they are still forming buds, but are definitely slowing down. I've stopped dead-heading so I can enjoy the seed heads this winter. Agastache 'Summer Sky' - Maybe my new favorite Agastache, this plant has bloomed since I planted it, on July 4. It has withstood every adversity and never once flagged in its performance. These are supposedly not tolerant of winter wet, but I'm hoping they will survive since they are planted on a slope...if not, I won't hesitate to buy new ones next year. 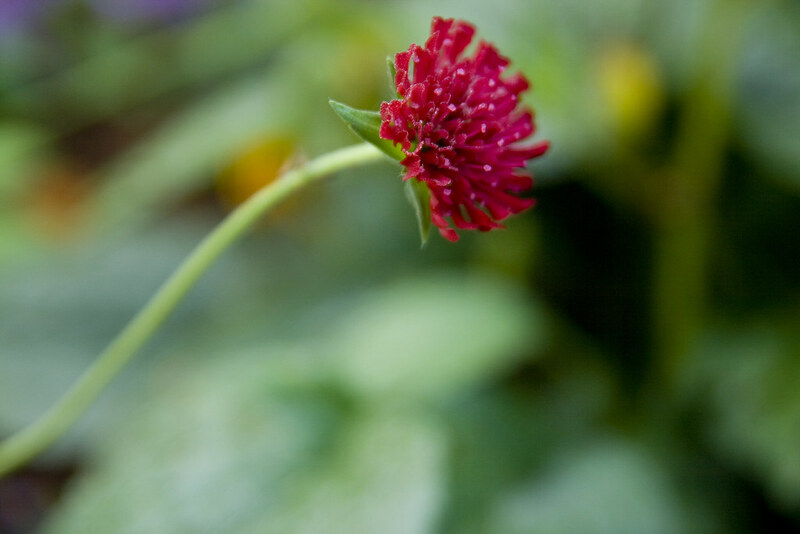 Knautia 'Mars Midget' - Another non-stop bloomer, planted at the same time as the above Agastache, and has bloomed just as long...I will never be without these, even if they don't over-winter, I wouldn't hesitate to plant more. 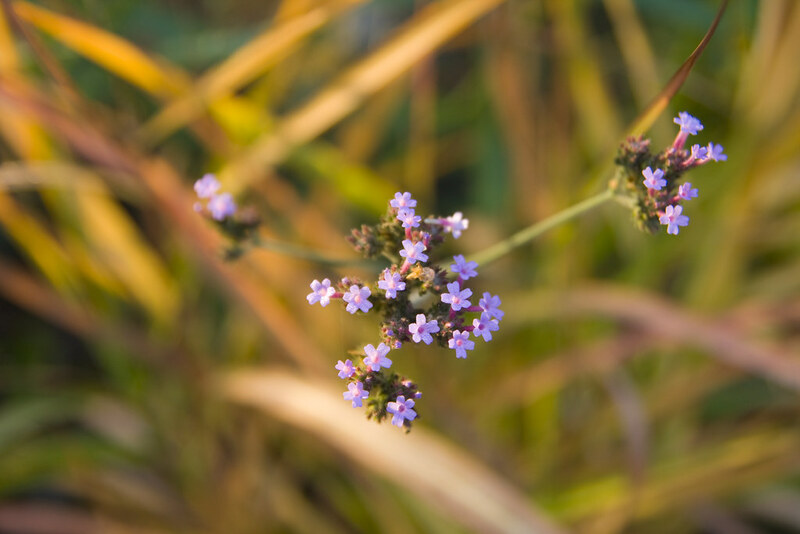 Verbena bonariensis - Shown with Miscanthus purparescens behind it, this is another non-stop bloomer...I've realized I just can't have too much of this wonderful, versatile plant. 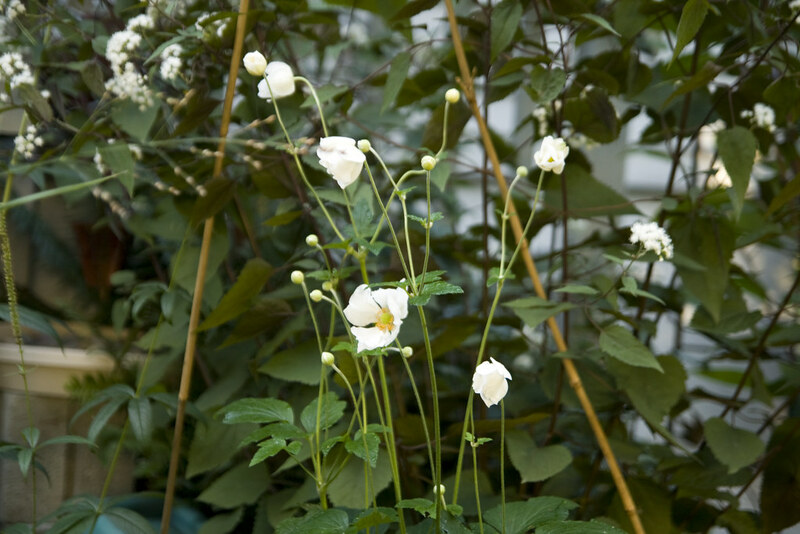 Anemone 'Honorine Jorbert' - My first (but definitely not last) Japanese Anemone. Planted just a month or 2 ago, I didn't expect it to bloom this year. Hopefully this is a sign it is happy and will thrive in this location, which has proven very tricky. 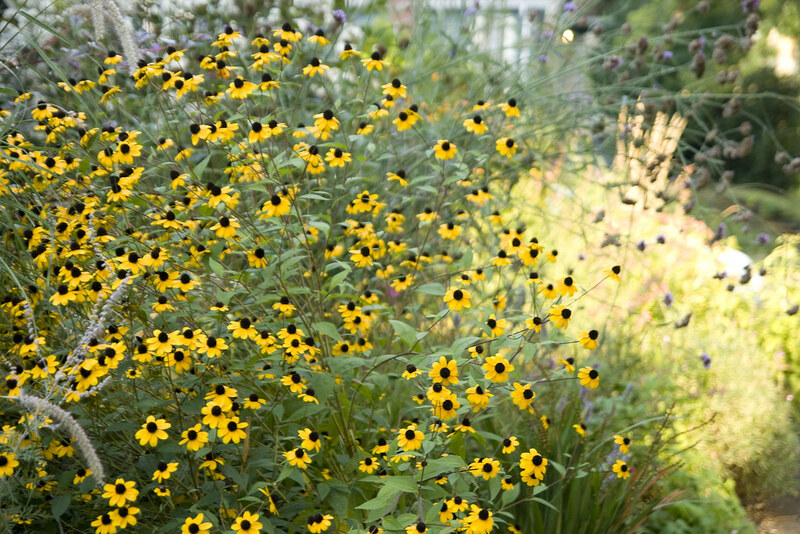 Rudbeckia triloba - This plant just keeps going and going, showing no sign of letting up. I love the bright, cheery cloud of yellow it provides. 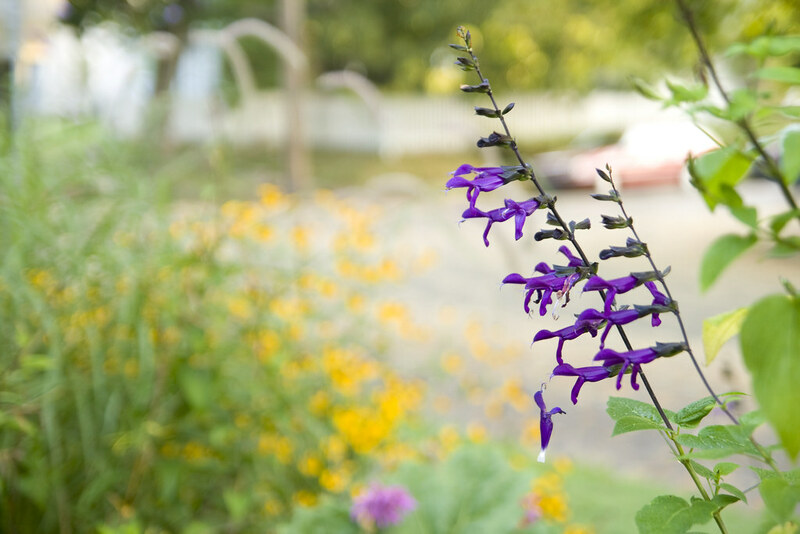 Salvia 'Purple Majesty' - While I love these flowers, the plants have proven to be unbelievably sprawly. 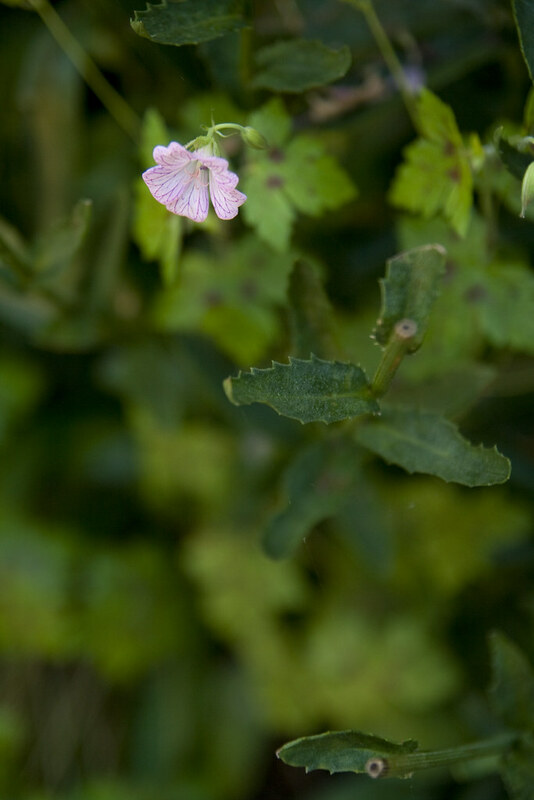 The stems are so fragile that they are constantly snapping. Amazingly, they stems continue to grow, even if just a tiny bit is still attached. I'm hoping the fragile stems are just a result of them being mail-order plants, so oddly shaped when planted. Time will tell, if they are this fragile next year, I may have to replace them...or move them to a VERY sheltered location. 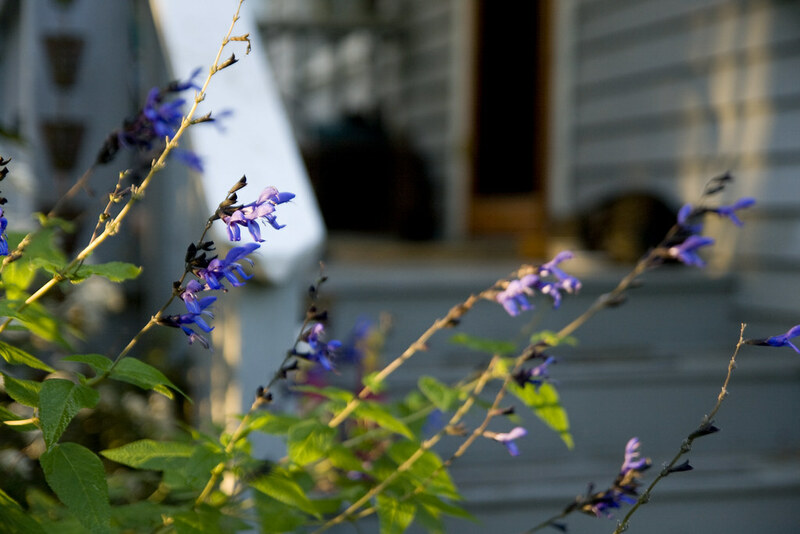 Salvia 'Black & Blue' - Have been blooming for about 3 months now, just wonderful and beloved of the family of hummingbirds that frequent the garden. Agastache 'Tutti Frutti' - While I love the flowers of this Agastache, there is no plant in my garden that flops to such a degree. They start out well, but as the stems elongate and get taller, they sprawl, then flop, covering any other plant nearby. I'm not sure if it's just me, but it's really aggravating this summer. I'm not sure what I'll do with them, as they are the longest-blooming plant in my garden, and extremely though. Fragraria 'Pink Panda' - my little ornamental strawberry is putting out a few new, little blooms! 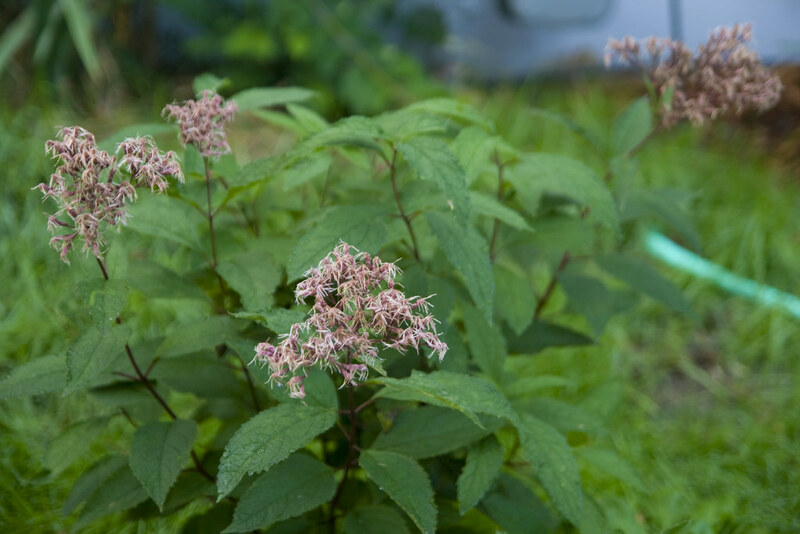 Eupatorium atropurpurea - Although the older Joe Pye Weeds finished blooming a month ago, this one I planted later this summer has a new flush of flowers, since I cut it back after planting. 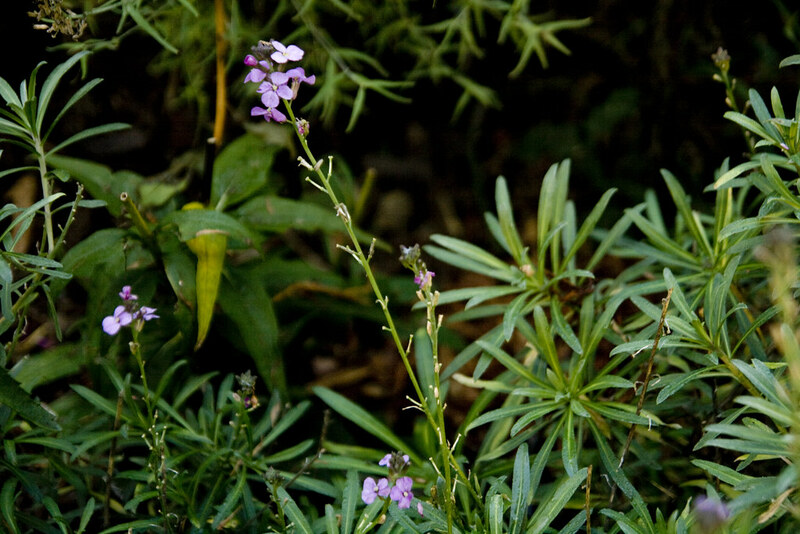 Erysimum 'Bowles Mauve' - With the cooler weather, the remaining Erysimum have started putting up flower stalk again, not many, but nice, nonetheless. Echinacea 'Prairie Splendour' - I think this may be the last of these for the season. Agastache 'Acapulco Orange' and Origanum 'Walter's Gift' - Two more long-blooming beauties, in the last stages of their bloom. Sedum 'Autumn Joy' - My favorite stage of their bloom, aging from rose to a deep red. Helenium 'Mardi Gras' - While not as abundant as earlier, with regular deadheading, these will bloom until frost cuts them down. Monarda 'Jacob Cline' - I cut this back a month or so ago, I think this may be the last bloom this year. Last, but not least, is my little patch of Muhlenbergia capillaris, also known as Pink Muhly Grass. 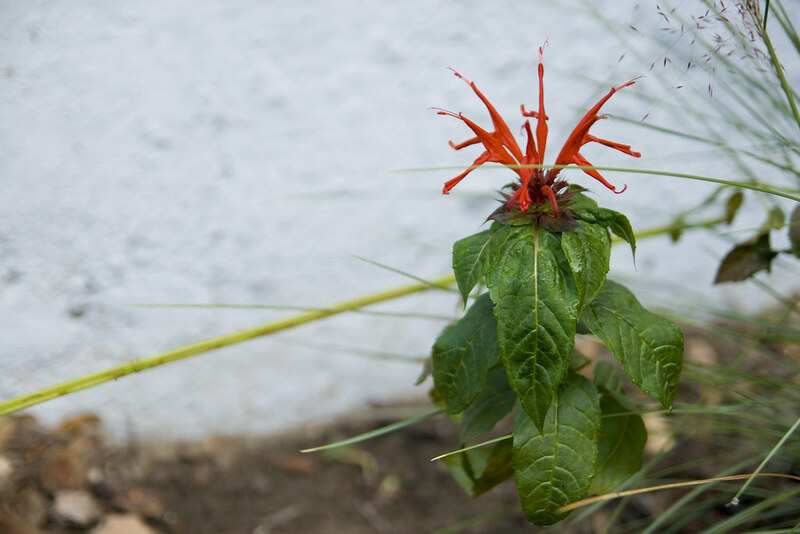 I was inspired to plant these, along with an Amsonia hubrichtii, after seeing them planted in a book by Nan Ondra. These are just starting to bloom, and are only a year old, so the display isn't as intense as it will be in following years. Even so, in person, it looks like a wonderful, metallic pink cloud! In the background, you can see Aster 'Purple Prince'. Just beautiful! 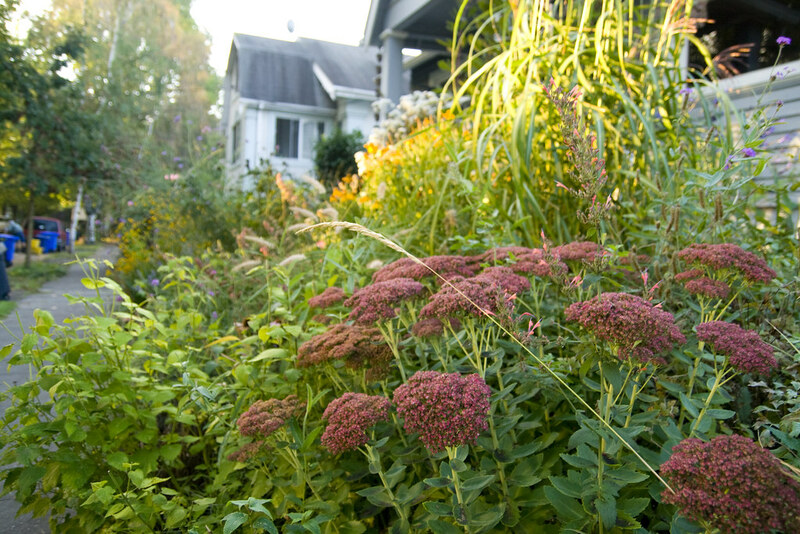 Your home is adorable...I took some notes here, love the persicaria Taurus.. The perennial selection in your garden inspires me to continue searching for more late blooming varieties. My photographer friends tell me that they take the best shots when there is no sun. Seems to me that the great pics that you posted also benefited from shade. If you would like inspiration on populating a shade garden with appropriate plants, visit Teza's Garden at Blotanical and scroll through over two years of postings. 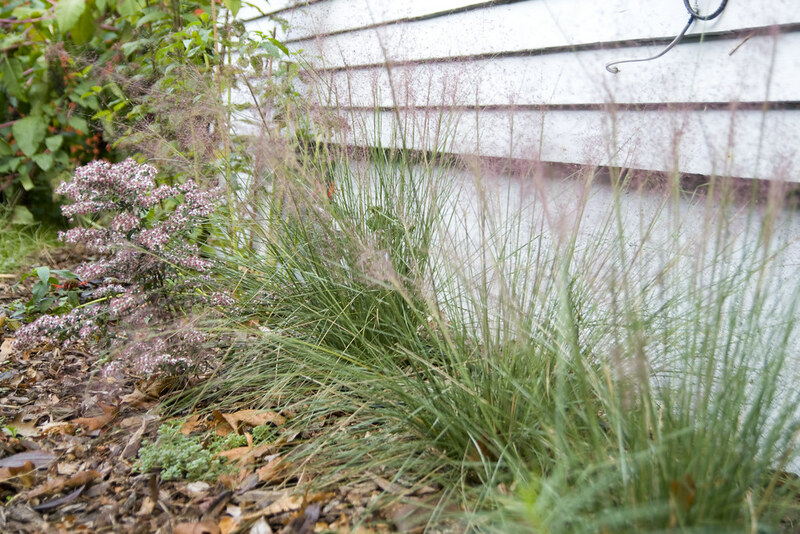 It looks as though your garden is doing beautifully, and don't you just adore the Muhlenbergia capillaris. 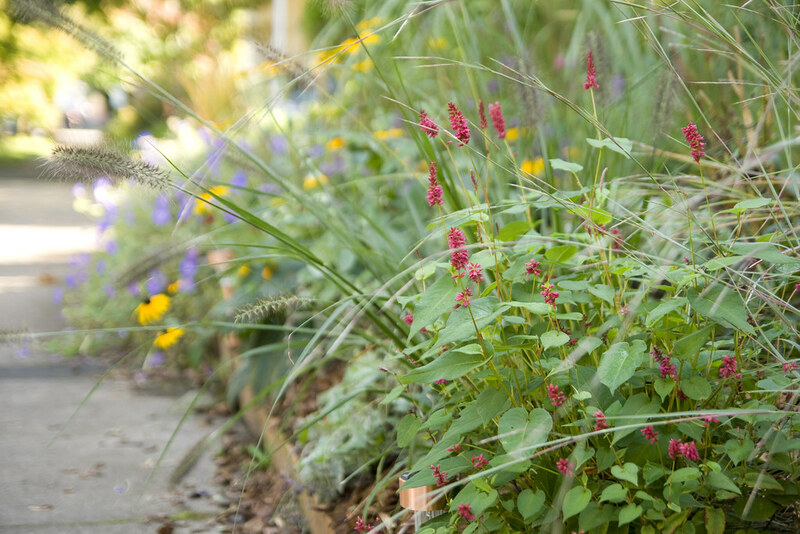 Ornamental grasses are among our favorite plants in the garden for nearly year-round interest. Scott your garden is stunning - it was lovely to see it from a distance this time aswell. I still have Anne Folkard and Rozanne in flower here aswell as a Persicaria, Centhranthus and R. Goldflame. Anne Folkard is quite new to the garden so she hasn't started to scramble all over the place yet and Rozanne is simply wonderful and every garden should have one. Eupatorium 'Chocolate' is on my wish list for next year as I love its rich colour of foliage aswell. What a lovely garden. So many beautiful blooms and photos.I am glad you had the full view. It is nice to see the blooms in context. Absolutely fantastic photos! Wow. I agree on the Eup Chocolate- it's all about the foliage and love to see the Persicaria 'Red Dragon' - just added a few last week and can't wait to see how they turn out. I love the way you have landscaped your garden. 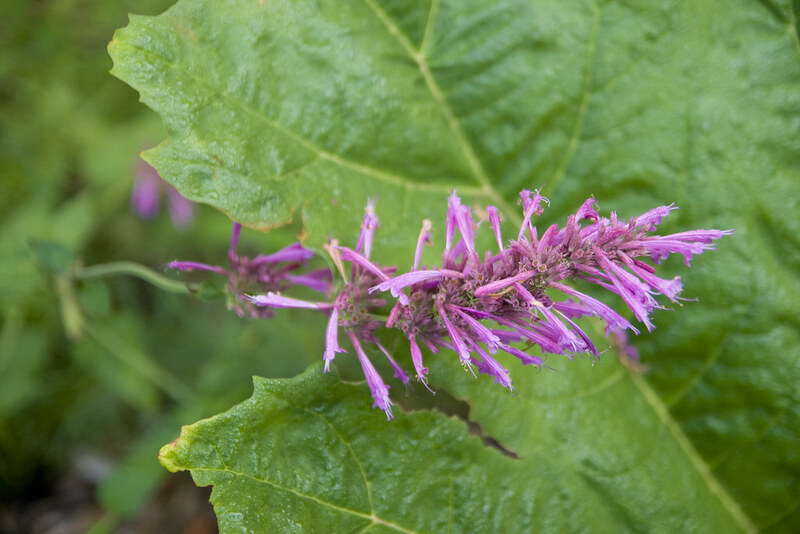 All that agastache, which I love and Honorine jobet, I think I may need some of that to go with my pink ones. Wouldn't that look stunning? What a lovely spot you've created. I also love the Japanese anemone. Mine is planted in the dry shade of an old French lilac. In its 4th year it is about 3 1/2 feet tall and full of blooms. I hope we both have them for a long time. Wow! You really do have a lot blooming at the same time. Like your garden and house too. It's different over here. Oh, to have a house that was in full shade all day! My dream, really. Imagine the utility bills! Anyway, you have a beautiful, lush garden! I really love those yellows (Helenium and Black-eyed Susans) and purples (Salvias and Agastache) planted together. That is a wonderful combination. Great photographs too! They seem kind of 3-D. VERY nice! You have a beautiful garden. I can definitely empathize with the shade. Ah, aren't we lucky, no frost so far, and no serious frost to come... love the asters. What a lovely garden and plant combos. 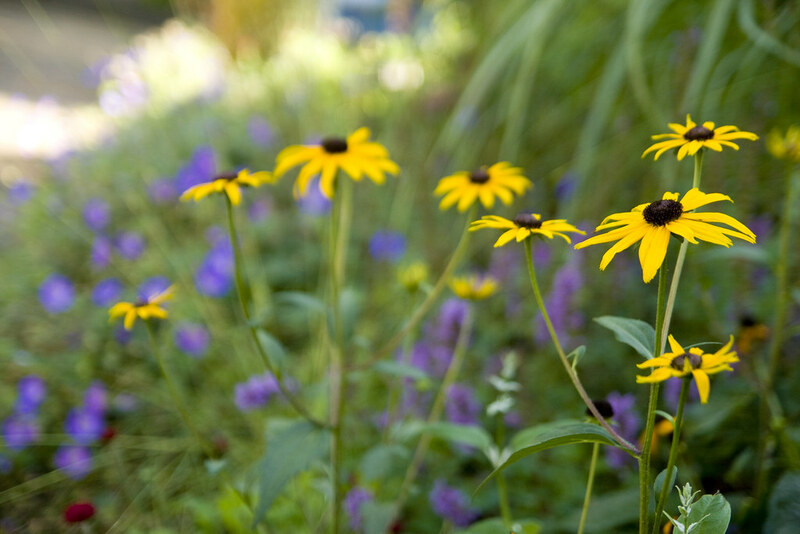 I especially love the purple agastache and rudbeckia together. 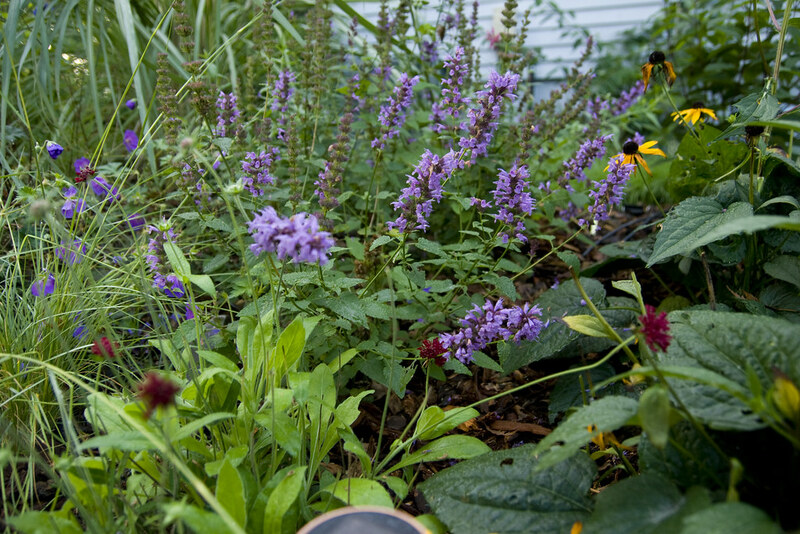 Also love that purple salvia. 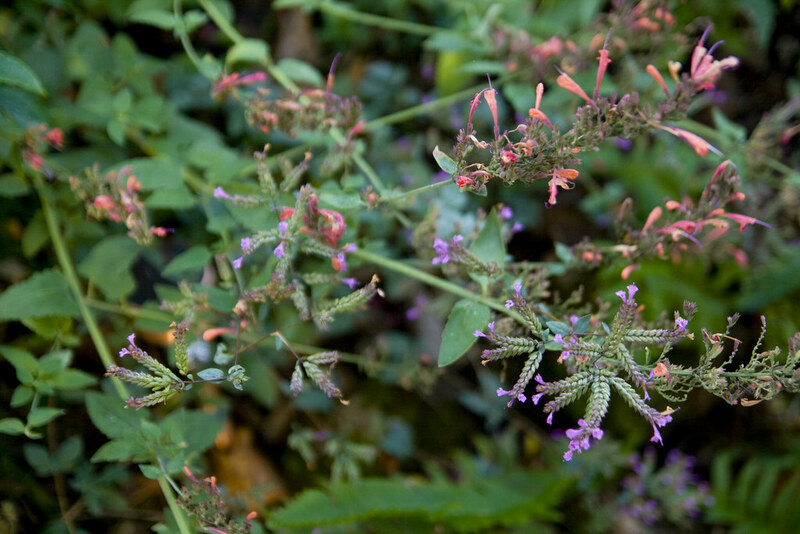 I have some coral salvia like it in a pot this year and it has sprawled and breaks off easily but otherwise has been a joy all summer. 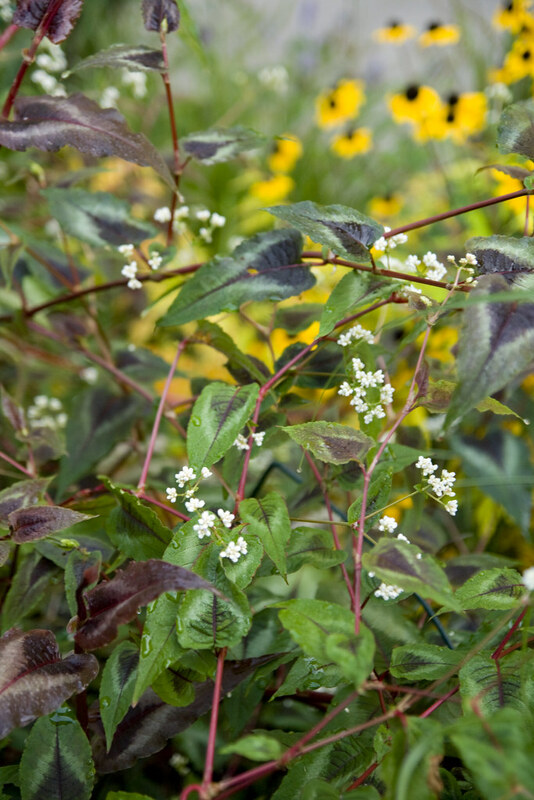 You have some of my favorite plants in your garden...the Chocolate Eupatorium, Persicaria 'Red Dragon', and the Rudbeckia 'Triloba' - all easy, easy, lot of bang for the buck. Great pictures. Thanks for the tour. I have an aunt in the McMinville/Dayton area, and we've loved every trip to Oregon. It's a gardener's haven!! Gday Scott. Thanks for the info on my plants. What a prolific garden you have. Hard to pick a favourite, but I think Verbena bonariensis would just make it to top spot for me. A beautiful garden and lovely pictures. I have the Eupatorium 'Chocolate' blooming but did not include it as it is looking a bit ragged. Like you, I have planted it primarily for its great foliage. Hi Scott ~ So glad you visited my garden for GBBD as it led me to yours! Your garden is charming and I thoroughly enjoyed my tour. 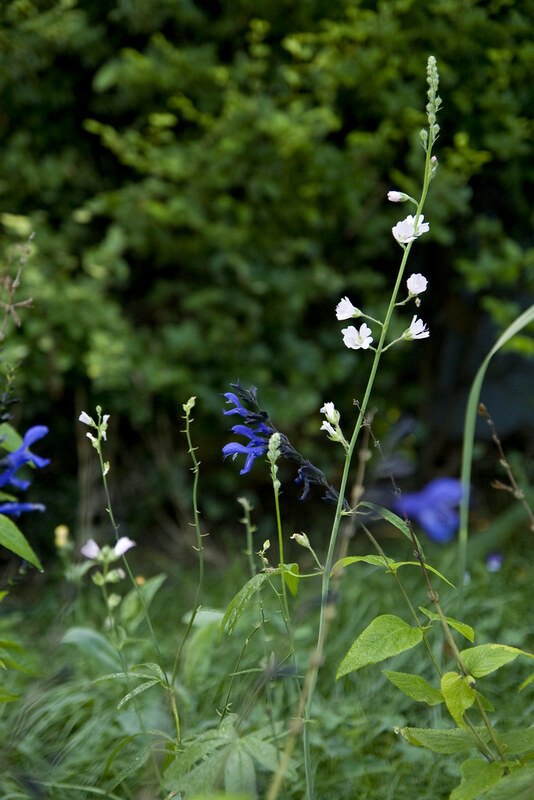 I have an unidentified Salvia in my garden and I believe it may be the Purple Majesty you describe. It's somewhat leggy and fragile stemmed but it does put off the most vibrant of flowers and they've really brightened up a somewhat dark corner of my garden. I posted a picture of it in my "It's all in the Details" post if you'd like to compare. I'm thinking a good shearing early in the summer might keep it more compact. Also, the Outlander series is one of my favorites! :-) Have a great weekend. 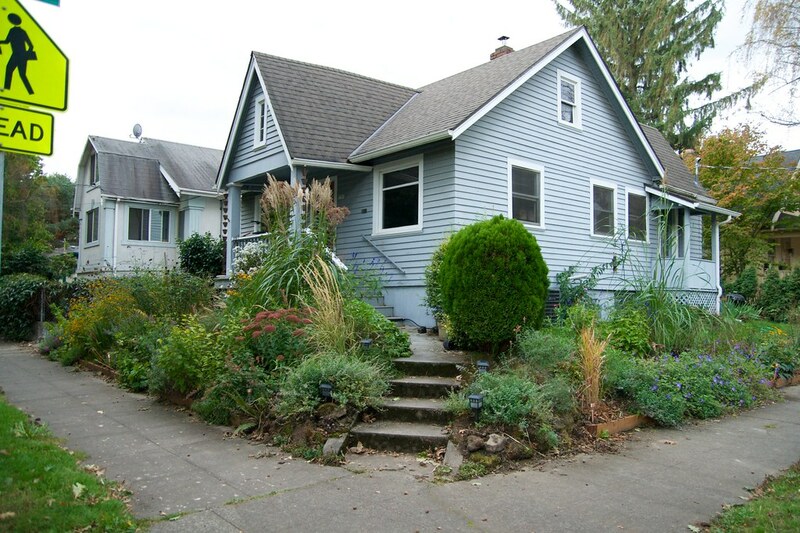 I do love Portland, and the gardening scene there! btw, Just left a comment on your Blotanical plot: your E. Chocolate looks exactly like mine looks today, here in Northern California. One would never guess a struggle of any kind lay behind your stunning garden. I love your place! I can't remember if I knew how many plants we have in common. At least half or more of what you have here, I also grow. I just got some seeds of the persicaria, which I also call knotweed, from a friend. I keep forgetting to see whether I should plant them in the fall, or wait until spring. 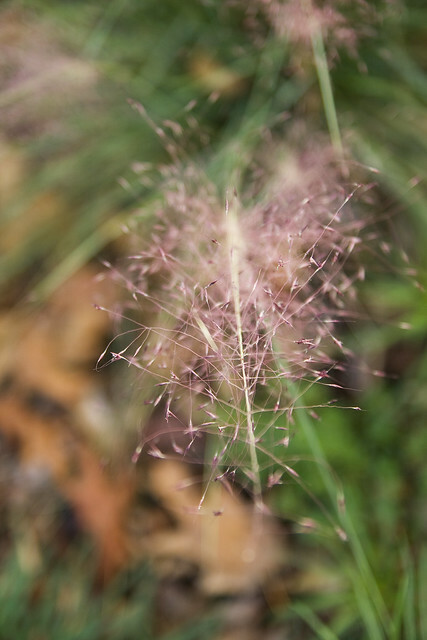 I have admired the pink muhly grass on blogs. I need to see if it will grow here, since I see it's doing well in your yard. HI Scott, thanks for visiting my GBBD post! I adore your precious garden. 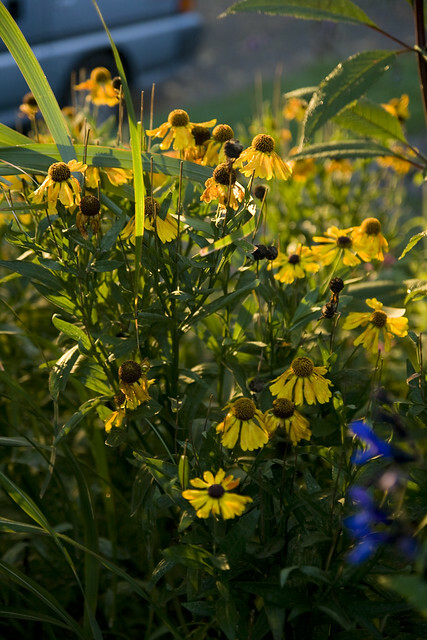 I just got a packet of Rudbeckia triloba seeds and I can't wait for a cheery cloud of yellow for my very own! Goldstrum is very reliable but the blooms peter out too quickly here in Central Texas. 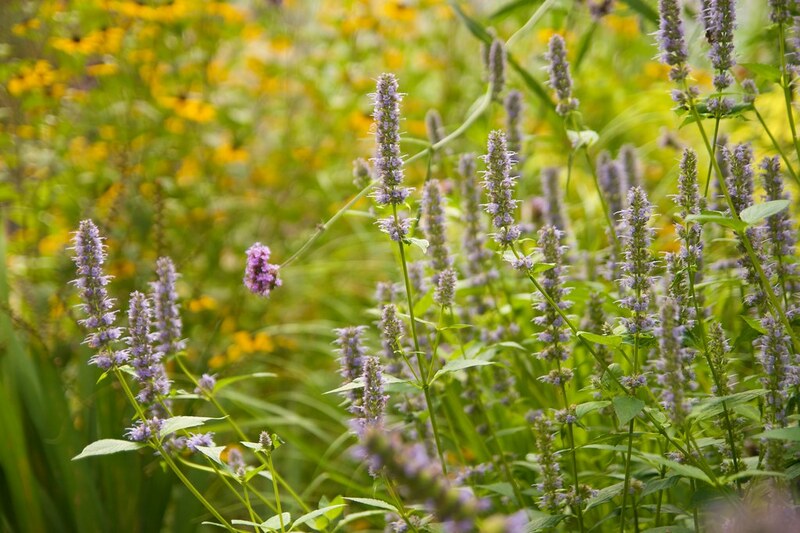 Your post reminds me I need some agastache, too! 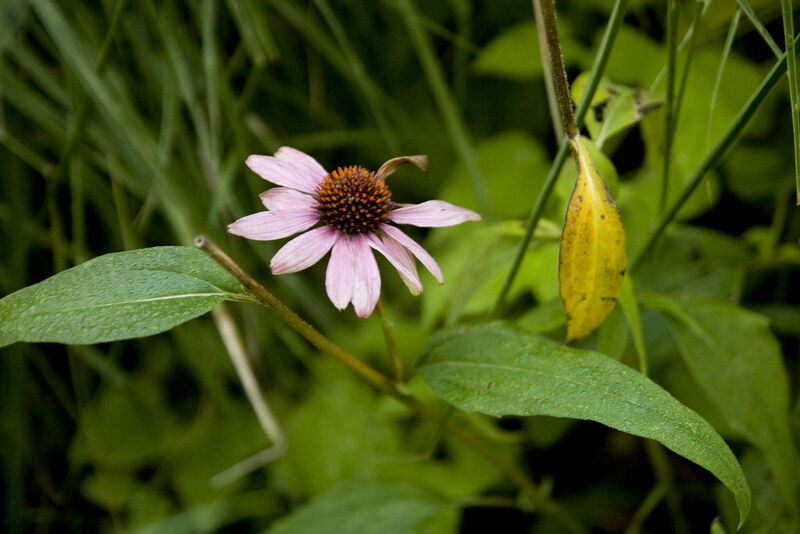 Can you believe Austin, TX and Portland, OR are both in USDA zone 8? We can grow a lot of the same things (though you probably get tons more rain). What a great garden and blog. I'm adding it to my reading list. BTW, I'm excited to see your Autumn Joy. This is my first year with Mini Joy and from your photos, the best is yet to come. Your garden looks great. Your pictures captured individual plants, but still gave us a glimpse of the garden design. Wow! I love your garden and the last photo gives it all a "place." My sister lives in Eugene, I've yet to visit Oregon...it looks lovely from your lens! Wow. Beautiful blooms. I need some of that knautia and more agastaches after seeing this. Love all the persicarias ... I just planted some but the blooms were eaten before I had the chance to enjoy them - so glad to be able to enjoy yours. I'm not sure what variety I have - have to look that up again and add some others. I accidentally weeded my verbena and everytime I see these blooms I curse myself - but do so enjoy. Next year, next year. Your photographs are amazing, I took some note of some of your plants for next year's garden. I'm especially interested in Knautia and the Geranium Rozanne. Thanks for coming to my blog and commenting. I am really behind with blog visiting at the moment Scott but wanted to say how much I enjoyed your October blooms. I am off to investigate persicaria 'Taurus' forthwith. Lovely to see 'Pink Panda' ~ I lost this strawberry and was most upset. I was delighted though to be offered it back by a friend in my gardening club. I had planted an edible container as a raffle prize a few years ago, she won it and she still had 'Pink Panda' flourishing :) There is also a most pretty strawberry with a variegated leaf - proper name escapes me at the moment ~ have you come across it? as long aas I provide credit and sources back to your blog? My blog is in the exact same area of interest aas yours and my visitors would really benefit from a lot of the information you provide here.